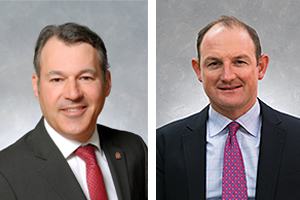 Walter Surface Technologies today announced two senior level appointments naming Marc-André Aubé to Chief Executive Officer and David Wright to Vice President Corporate Development. Following the recent acquisition of Walter Surface Technologies from ONCAP, in partnership with the existing management team, Marc-André Aubé has been promoted to the CEO position from his current role of President and COO. Mr. Aubé joined Walter in February of 2017 and has been instrumental in soundly executing on the company’s organic and inorganic growth strategy. Prior to Walter, Mr. Aubé was President and Chief Operating Officer of GardaWorld Protective Services where his main responsibilities included driving the company’s annual growth and ensuring operational excellence within a team composed of 26,000 Canadian security professionals. He is a trained engineer with an MBA and a CFA designation. Mr. Aubé’s professional background features experience in various sectors, such as chemical products (Nalco Canada), oil (Petro-Canada) and finance (Caisse de dépôt et placement du Québec and Scotia Capital Inc.). In addition, David Wright has been promoted to Vice President of Corporate Development. In his role, Mr. Wright will be leading strategic initiatives for the company including special projects and acquisition opportunities to deliver on the company’s global growth plan. Mr. Wright joined Walter in 2015 as part of the company’s Next to Succeed leadership program after which he held the position of Business Development Manager. Mr. Wright has a B.S. from the United States Merchant Marine Academy and an MBA from the Rotman School of Management, University of Toronto. Prior to joining Walter, Mr. Wright was an Olympic Athlete in the sport of sailing – competing in the 2012 Olympic Games in London, England. Walter Surface Technologies provides innovative solutions for the global metal working industry. From high performance abrasives, power tools and tooling to industrial parts washing systems, cleaners, degreasers and lubricants Walter focuses on helping its customers work better. Founded in 1952, the company is established in 7 countries throughout North America, South America and Europe. International headquarters is in Montreal and U.S. headquarters is located in Windsor, Connecticut. Key certification and awards include ISO 9001: 2008, Wall Street Journal Award; Deutscher Material Preiz; American Eagle Award; CleanTech Cleaning Technology Award. New TOOL MANUAL from PFERD provides comprehensive detail on product.